This is my first time reading the work of Calia Read therefore, I had no idea what to expect. Anyway, the story ended up being a good read as it provided me with much-needed entertainment to keep me engaged to the end. Although this is the third book in the Sloan Brothers series, there is no need to read the previous books before reading this installment. This installment introduces readers to complex and enigmatic Mathias Sloan. I found the prologue, which set the pace for the rest of the story, intriguing. After that intense scene, I was curious to learn of the events that led to that moment. Rewind two years earlier, Mathias is offered an opportunity to tutor the granddaughter of his grandparents’ friends, so she can improve on her skills as a pianist. Reluctant at first as it would mean moving to Germany for six months, he accepted the offer knowing it would provide him with the chance to work his way back to the think he loved the most playing the piano. There was one stipulation his association with her was to remain professional, which for Mathias would be easy or so he believed. Katja wanted one night where she could let down relax and let down her hair before starting her piano lessons with her new instructor. While at the hottest nightclub with her friend, she laid on Mathias. The moment she saw him she wanted him. She gave him a false name and age, thinking she would never see him again. That night turned out to be the most intense moment of her nineteen years. So imagine her surprise when she showed up for her piano lessons the following day to discover that the man who made her feel things she never thought possible would be her instructor for the next six months. OOPS! Awkward much. Working together would prove to a big challenge for these two. The chemistry they shared was intense, but not once did they cross the line. It was not until the end of their tutoring session they explored their feelings for each other. Their relationship however proved to be stormy and rocky, with Mathias being the main obstacle. I did not appreciate the manner in which he treated Katja. His propensity to keep hurting Katja and her allowing him to manipulate her feelings for him frustrated the heck out of me. I loved that in the Katja came to her senses and made him work to prove his love for her. I felt sorry for him after a while when I saw how hard he had to work to regain her trust. Mathias was an enigma. I knew nothing about him. It was not until halfway through the story that I gained insight into his background. What I managed to figure out was that he feared falling in love, he had trust issues and he allowed no one to get close to him. Katja was the first person to break through the wall he built around his hear. For someone so young (26 years old) he was very cynical. He was clearly broken, which was evident from his actions. Katja is the opposite. She was afraid to express how she felt. She knew what she wanted and went after it. I admired her strength. She did not allow Mathias indifference to her feelings break her. If anything, it made her stronger. A well-written story told from dual POVs, Ruin You Completely, will take you on an emotional roller coaster ride. Passionate, gripping and all-consuming this story will hold your hostage making it difficult for you put it down. 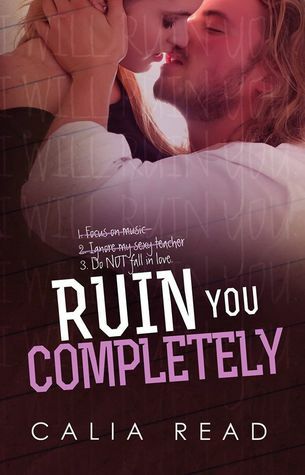 Ruin You Completely is an emotional story, which demonstrates the healing and purifying power of love. A wonderful read through and through.